PFW Fall 2014 Trends: Practicality and Eclecticism. 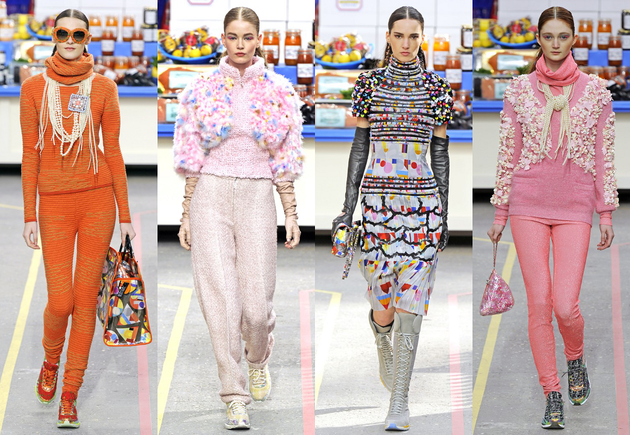 Karl Lagerfeld chose a supermarket theme for the extensive 78-piece Chanel fall 2014 collection. The designer transformed the Grand Palais into a giant supermarket and continued to explore the sporty casual theme that defined the Chanel spring 2014 couture line, this time even more playfully than in the past. The line featured colorful oversized coats with Pop Art elements, metallic pants, chic textured tweed pieces, slouchy leather items, fun variations on sweatpants, and several boleros and dresses with exaggerated rounded shoulders. The accessories chosen reflected the designer's sense of humor. Sneakers and sneaker boots as well as neon clutches, glammed-up shopping baskets, plastic wrapped quilted chain bags and statement retro sunglasses complemented the outfits the eccentric designer put forward. See the complete Chanel fall 2014 collection! Not a single pair of pants could be spotted in the new Miu Miu fall 2014 collection. Instead, designer Miuccia Prada preferred to put a feminine playful spin on the new creations, without completely sacrificing function in the process. Sportswear influences, sweet pastel tones and color blocking, quilted dresses, nylon jackets layered over hooded windbreakers and boyfriend jackets where some of the elements that defined the designer's desire to bring wearable, non-pretentious, utilitarian options into the spotlight. View more from the Miu Miu fall 2014 collection! A strong focus on coziness could be instantly spotted in the Hermès fall 2014 collection. Designer Christophe Lemaire honored the label's heritage with a luxurious set of offerings displaying many masculine accents. Relaxed silhouettes, oversized coats, slouchy straight legged pants, pleated long skirts, knitwear, silk scarves and leather dresses were among the most memorable pieces from the new line. The color palette was relatively subdued, revolving mostly around navy, cream, black, brown, camel and muted green tones. 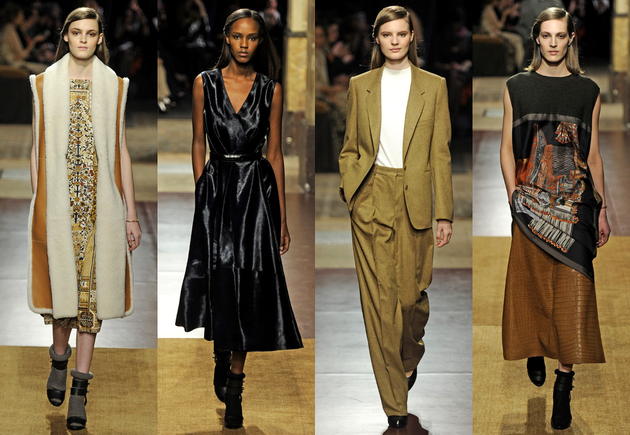 See the full Hermès fall 2014 collection! Practicality had a distinguishable rock influences in the newest Zadig & Voltaire fall 2014 collection which reflected once again Cecilia Bönström's amazing ability to design clothes with a lot of attitude while still keeping in mind practical needs. Among the most intriguing options from the new line were knits, grungy sweaters, edgy leather jackets and chic cigarette leather pants along with the cool jumpsuits. The label also brought a few feminine options into the spotlight through a few simple floral printed dresses and chic lace and cotton-gauze skirts. See the complete Zadig & Voltaire fall 2014 collection! The Louis Vuitton fall 2014 collection was without a doubt the most awaited runway show of the Fall 2014 Fashion Week edition as it marks a new chapter in the history of the brand, under the creative guidance of Nicolas Ghesquière. The designer stated he strove for timelessness and authenticity and didn't try to replicate the vibe his predecessor based his collections on nor did he try to bring back elements from his days as a creative director for Balenciaga. Instead, he put forward an interesting array of wearable outfits with a fresh twist. 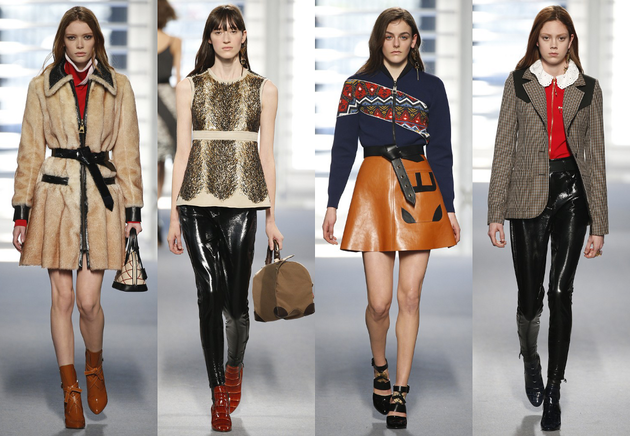 See more from the Louis Vuitton fall 2014 collection!